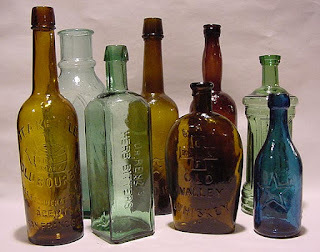 Western Bottle News: 50th Annual "NORTHWESTERN ANTIQUE BOTTLE COLLECTORS" Show! 50th Annual "NORTHWESTERN ANTIQUE BOTTLE COLLECTORS" Show! Come shop or sale at our 50th annual show this year. We still have a few sales tables left for anyone interested. There is the “Farmers Market” Saturday & “Collectors Flea Mkt.” Sunday all the the same location and time. We're expecting a good turnout, these two events draw lots of people to the Venue. There will be an old time collection hit the market this year in addition to many dealers from all over with new additions. Come celebrate our 50th show at the Saturday night dinner for dealers. We have once again reserved the Garden Room at the popular “Union Hotel” restaurant next to Santa Rosa creek. Great food, full bar, raffles, good times. Howdy Boys,so how was the show? Who Was Dr. D.B. Vincent?